Tony Robbins despite not releasing a book in a good while (17 years) is still known by a considerable portion of those adults in the United States. His advice has helped out many people and his writing style imparts a great amount of knowledge to those that read his books without being technically difficult or otherwise obtuse. As it has been a few years since Tony Robbins has released a book some of the specific information that he has provided in his earlier titles may be a little out of date. To address this his latest book – MONEY Master the Game: 7 Simple Steps to Financial – exists at the cutting edge of fiscal advice and will be useful for the next 5 to 10 years going forward. Specific advice concerning savings, investing and over all week to week money management will ensure that those that are even the farthest underwater will be able to rectify their situation in a few short years. The book is available from a wide array of booksellers both online and in brick and mortar locations. Make sure to purchase this book if you are either trying to start saving money, have something down the road that you would like to purchase or just want to create a legacy of comfortability for your descendants. 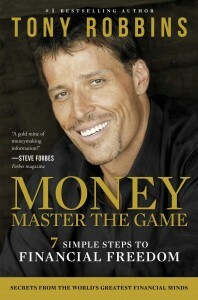 Tony Robbins still has it.